As stylish and discreet Mini-ITX rigs become more popular among PC builders, graphics card manufacturers are coming up with increasingly smaller GPUs. 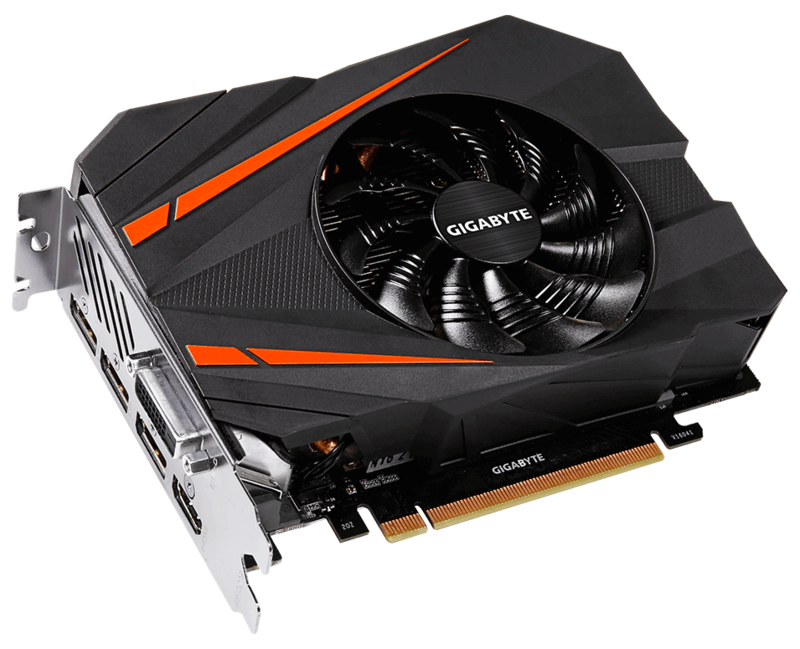 Now, Nvidia board partner Gigabyte has revealed the smallest GTX 1080 card ever released: The GTX 1080 Mini ITX 8G. For those who want the smallest build possible without compromising on gaming power, this “tiny but mighty” card should fit the bill. It measures just 6.7 inches in length; that’s almost 4 inches shorter than the 10.5-inch Founders Edition GTX 1080. And the other measurements are just as minuscule: Gigabytes’ card is only 1.5 inches high and 5.2 inches wide. The Mini ITX 8G comes with a Nvidia reference 1607 MHz base clock and 1733 MHz boost range. There’s also an OC mode profile that pushes the base clock up 25 MHz to 1632 MHz and the boost up 38 MHz to 1771 MHz. Keeping everything frosty in this dual slot card is Gigabyte’s own cooling system, which consists of three composite heat pipes designed to maximize the direct contact area to the CPU. They travel through an aluminum fin stack that’s cooled by a 3D Active semi-passive 90mm fan, which uses a set of 3D stripes on the surface that Gigabyte claims improves airflow by 23 percent compared to traditional fans. Additionally, Gigabyte says that thanks its 5+2 power phases, the Mini ITX 8G overclocks better than the Founders Edition reference card and its 5+1 phase design. The 8G also offers 'one click super overclocking' through the Aorus Graphics Engine utility, and is powered by a single eight pin connector. No word yet on pricing or availability. If you're looking for something that's a little larger but offers more power, check out Zotac's GTX 1080 Ti Mini.